We are the UK’s export credit agency and a government department, working alongside the Department for International Trade as an integral part of its strategy and operations. We work with 70 private credit insurers and lenders to help UK companies access export finance (the particular class of loans, insurance policies or bank guarantees that enable international trade to take place as easily and securely as possible). We exist to complement not compete with the private sector. We can support exports for any size of company and across all sectors, from capital goods to services and intangibles such as intellectual property. Summary video of UK Export Finance and how it operates in UK, Europe. Try and insert the caption from the YouTube video here. When it comes to exporting having a great product or service is only half the story. Putting the right finance and insurance in place can make the difference, helping you win contracts, fulfil orders and get paid. As the UK’s export credit agency, working alongside the Department for International Trade, our involvement can help transform your business. 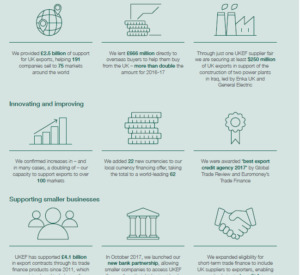 In the last five years we’ve provided £14 billion of support for UK exporters, regularly working in partnership with banks and insurance brokers to help realise business ambitions. What types of products and services does UK Export Finance offer in UK? Our mission is to ensure no viable UK export fails for lack of finance or insurance, while operating at no net cost to the taxpayer. Uk Export Finance was first introduced in attempt to promote the UK’s exporting presence in the globe after the affects of WWI.